Of course I have to start off with Killing Eve tonight at 8pm on BBC America. Tonight's episode is exactly what the last 5 weeks have been gently building up to. It's the epic the critics have praised the most and for good reason. For tonight is the night that Villanelle and Eve are face to face properly (the premiere doesn't count since Eve didn't know who Villanelle was). 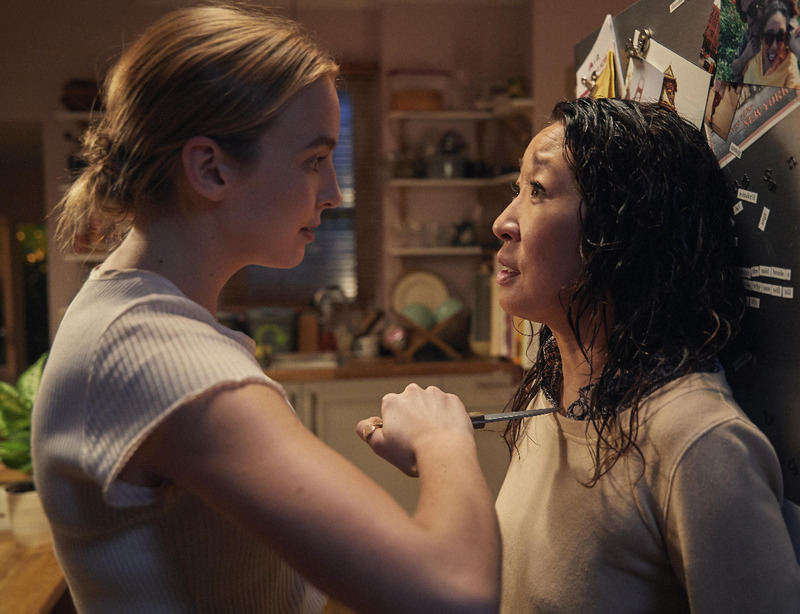 The episode is full of the wonderfully dark humour that has become Killing Eve's trademark, and be sure to check back here as soon as the episode has finished for our review. Having survived a terrifying close call with Villanelle, Eve now has the mole ensconced in a safe house and is buzzing; they have an exciting opportunity to glean information and crack this thing open. At 8:30pm on Fox, you can catch the latest episode of Brooklyn Nine-Nine. With Upfronts fast on the horizon, we'll soon know the fate of many shows including Brooklyn Nine-Nine which has been performing considerably better since it was moved back to its Sunday night. Rosa responds to an active shooter alert; the rest of the squad is forced to stay back; Jake frantically brainstorms ways to offer his assistance; Terry faces an existential crisis; Gina and Amy try to be useful by fixing Rosa's broken toilet. Over on NBC at 10pm is the latest episode of Timeless. It's another show staring the TV grim reaper in the face, as despite a strong fan campaign persuading NBC to give the show another chance, the ratings haven't been reflecting that fan support. Made even worse is the reveal that the season could in fact be ending on a cliffhanger, which if true would be an incredibly dumb move by the writers. One could be optimistic and believe given it took a miracle for the show to be renewed in the first place, they wouldn't have written a cliffhanger ending if they weren't sure the show was coming back. But in this grand old age of TV, there are no guarantees. The Time Team travels back to 1981 Washington D.C. on the day President Reagan was shot, only to discover that the Sleeper’s target isn’t the President – but a young rookie police office – none other than Agent Christopher (Sakina Jaffrey), who brought the time team together and kept the Lifeboat from getting into Rittenhouse’s hands. The Time Team must save Agent Christopher’s life and prevent her from making a mistake that set her on a different path that would forever change her own future, the future of the team -- and the future of the world. This late into the calendar it is a bit late for a newbie to be premiering, but that's what we have on Starz tonight at 8:30pm in the shape of Vida. I feel as though saying viewer discretion is very much advised is a given, considering this is Starz; 'showing off the skin' so to speak is as natural to them as love triangles are to The CW. Having had a chance to sample a couple of episodes, it does have the makings of a good series and the critics are certainly agreeing. Circumstances force estranged sisters Lyn and Emma to return to their old neighborhood, where they are confronted by their past and surprised by family revelations. Finally on CBS at 9pm is the latest episode of NCIS: Los Angeles. Judging from the sneak peeks released, it's going to be an extremely interesting episode. There are only 3 episodes left of the season, with the season finale coming in the form of a 2 hour special on the 20th May. I want to say that nothing can be as gut wrenching as last seasons finale & be extremely glad it's being delivered to us in one night but this is NCIS: Los Angeles so I won't count my chickens just yet. The team partners with the FBI when a Marine dies after being exposed to a rare nerve gas; Deeks shares his dream to quit law enforcement and open a bar. What're you watching tonight? Let us know in the comments!